Man Feed His Dog Using Twitter. We all know “Necessity is the mother of invention”, well it is proved by 30 years old IT consultant name Nat Morris, who spends a lot of time working away from home and isn’t always able to feed four-year-old Toby by hand, in a result he has rigged up an extraordinary way to feed his border terrier Toby a ‘tweet treat’ by sending him a Twitter message to @FeedToby. 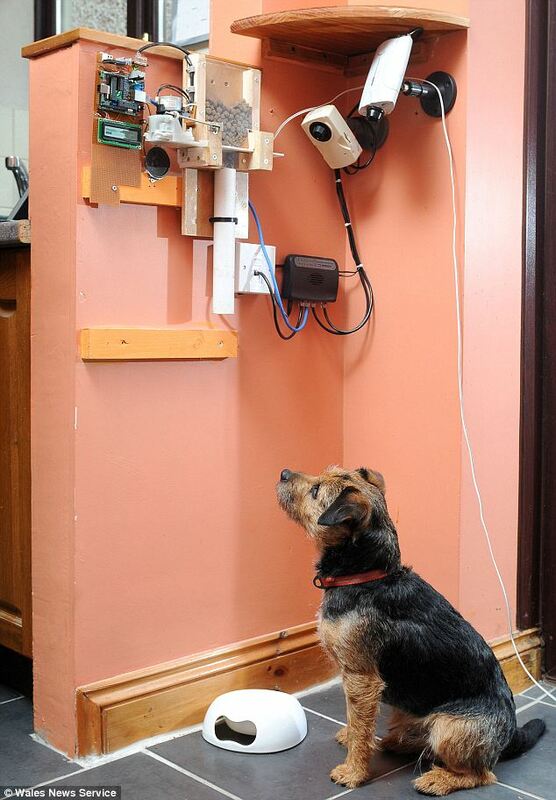 Nat has set up electronic system, when ever Nat sends a message to ‘@FeedToby’ , Toby get snakes through automatic food dispenser, using this he can feed his dog from anywhere in the world, isn’t it awesome ? Lets take a look at Nat’s invention.. When a message is sent to @feedtoby it is received by a mini-computer known as a Nanode microcontroller. This is linked up to little motor taken from a household printer HP Deskjet 500.When the mini-computer receives the message, the buzzer goes off and Toby comes running over and sits beneath a tube under his feeder contraption.Then the motor comes to life and pulls open a trap door which releases a serving of food.The doggy treat then comes dropping down the tube and into Toby’s food bowl.Then a digital camera then takes a photo of him and sends it back to Nat on Twitter – so he knows Toby has been fed. Well i personally think its an awesome and useful technique,what do you think about it? Must Add You Comments Below! Previous article Amazing Love Story In 22 Pictures. Next article This Is Why Fast Food Look Good In Ads.